Many people are concerned about vaccine ingredients. I have written elsewhere about two preservatives used in some vaccines (Mercury in retrogade and Formaldehyde in us and vaccines), but here I take a look at aluminum, which is a vaccine adjuvant used in Diptheria-Tetanus, Hepatitis, Haemofilus influenza type b, and pneumococcal vaccines (you can find aluminum concentrations for each vaccine from the Childrens Hospital of Philadelphia). Adjuvants are substances that enhance the immunological response to the vaccine, so they help make the protection long lasting without going through the full-blown disease and its consequences. Aluminum has been broadly used as an adjuvant in vaccines for 80 years. Local reactions such as redness, swelling and/or tenderness at the injection site are common side-effects of aluminum adjuvants. Most killed vaccines contain a very small amount of aluminium-based adjuvant. Although aluminium can be toxic in large quantities, no harmful effects are seen with the level of aluminium used in such small amounts in vaccines. 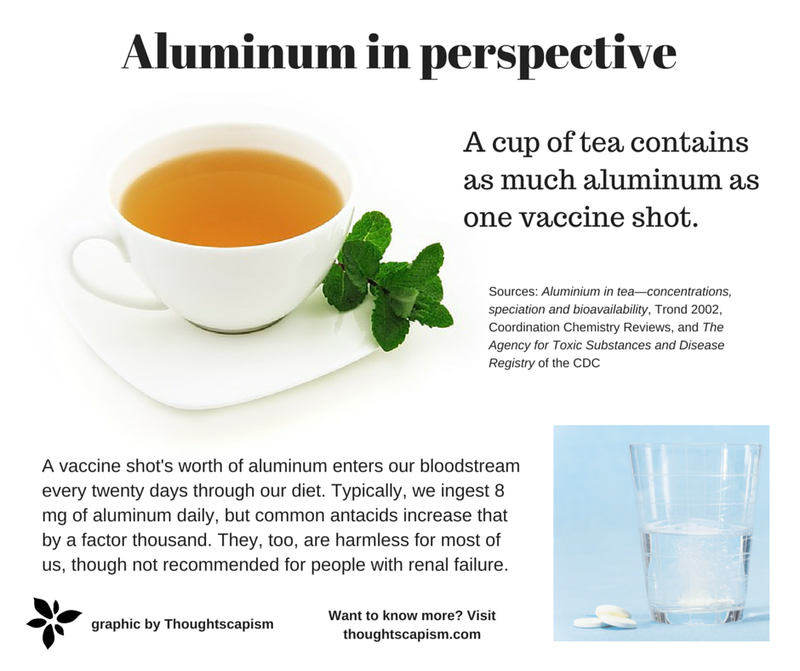 For a scientific study looking at safety of aluminum as an adjuvant, you can read more in this review: Adverse events after immunisation with aluminium-containing DTP vaccines: systematic review of the evidence. We found no evidence that aluminium salts in vaccines cause any serious or long-lasting adverse events. Using these updated parameters we found that the body burden of aluminum from vaccines and diet throughout an infant’s first year of life is significantly less than the corresponding safe body burden of aluminum modeled using the regulatory MRL. We conclude that episodic exposures to vaccines that contain aluminum adjuvant continue to be extremely low risk to infants and that the benefits of using vaccines containing aluminum adjuvant outweigh any theoretical concerns. On this personal blog is another table of vaccines and the aluminum they contain, this time calculated per infant and child blood volume. Something most people probably don’t realise is that they eat larger amounts of aluminum each day than what is found in vaccines. Luckily these levels are not high enough to cause us problems. Mostly our aluminum intake comes from diet. Tea is one of the major sources, with 1-6 mg per liter – a cup of tea will average roughly 0.75 mg of aluminum (or range from 0.25 – 1.5 mg). Other major sources include herbs, spices, bread, and salt. At any one time, we have around 30-50 mg of aluminum in our bodies, many times more than is found in any vaccine. At worst, we face local reactions when we get an aluminum-containing vaccine. Aluminium intake from foods, particularly those containing aluminium compounds used as food additives, represents the major route of aluminium exposure for the general public, excluding persons who regularly ingest aluminium-containing antacids and buffered analgesics, for whom intakes may be as high as 5 g/day (WHO, 1997). In experimental animals, absorption of aluminium via the gastrointestinal tract is usually less than 1%. Please consider the above when reading more about aluminum research. To avoid misconceptions, we should always review and weigh scientific evidence as a whole. People who aim to scare the public on mainstream science can choose one study or misquote another one out of context in order to make their message sound more powerful. These scare messages are also employed by people who themselves stand to profit from turning people away from evidence-based medicine. It is important to note that aluminum in medicines is under strict scrutiny and regulation, whereas many alternative ‘natural’ products (ironically aluminum, which is naturally occurring, could also be classified as a natural ingredient, and is found in herbs, spices, and tea) can be sold with the aura of wholesome healthfulness, whether they actually work, or even contain the ingredients promised on their labels – feat possible only thanks to the lack of regulation on supplements. You can read more about this in my piece Following the money. This entry was posted in health, medicine, nutrition, vaccines and tagged aluminum, WHO. Bookmark the permalink. “There is (still) too much aluminium in infant formulas”. I am very sorry that your comment seems to have gotten stuck somewhere on pending-approval-page a limbo together with a number of page-ping back comments which I have neither approved nor trashed. Thanks for providing an interesting link on the topic. The concentration of aluminium in ready-made milks varied from ca 176 to 700 μg/L. The latter concentration was for a milk for preterm infants. The aluminium content of powders used to make milks varied from ca 2.4 to 4.3 μg/g. The latter content was for a soya-based formula and equated to a ready-to-drink milk concentration of 629 μg/L. Using the manufacturer’s own guidelines of formula consumption the average daily ingestion of aluminium from infant formulas for a child of 6 months varied from ca 200 to 600 μg of aluminium. Generally ingestion was higher from powdered as compared to ready-made formulas. We found that the anthropometric patterns of children fed SIF were similar to those of children fed CMF or HM. Despite the high levels of phytates and aluminium in SIF, Hb, serum protein, Zn and Ca concentrations and bone mineral content were found to be similar to those of children fed CMF or HM. We also found the levels of genistein and daidzein to be higher in children fed SIF; however, we did not find strong evidence of a negative effect on reproductive and endocrine functions. Immune measurements and neurocognitive parameters were similar in all the feeding groups. In conclusion, modern SIF are evidence-based safety options to feed children requiring them. The patterns of growth, bone health and metabolic, reproductive, endocrine, immune and neurological functions are similar to those observed in children fed CMF or HM.